A reader asked me the other day how I managed to write such timely posts, such as where to buy your first appliances after moving here. It turned out she was just planning to go out on that very errand. I think my timing is inspired by all the questions I get from newly arrived expats, and there has been a spate of them lately with the beginning of the new (American) school year. So once you’ve set up your internet, got a cellphone, hired domestic help, and bought your car, the next question inevitably becomes: How the hell do I pick a place to go on safari? Or if your family is anything like ours, you will still be working on the cellphone and car and sitting atop a mountain of stuff the movers just dumped in your house, wishing for an entire week of uninterrupted time, when your spouse tells you to book a safari for next weekend because he has a day off on Monday. What, leaving the house now when it looks like a tornado touched down? That was my first thought. In fact, I was harboring the wish that I could just send Noisette on safari with the kids so I’d have time for the house. I hate living in clutter, though sometimes I suspect that Noisette doesn’t entirely believe that. But how to pick from all the many lodges out there? That will be the question once you’ve gotten over the first shock of finding out how terribly expensive it is to go on a safari or pretty much anywhere else in Africa. I’ve found that R3000 per night per adult is pretty much the standard rate at an all-inclusive lodge (which all of them are). This is if you want to see the Big Five (lodges in reserves without the Big Five are cheaper and can also offer a lovely vacation). If you can get a rate of R1500, that is pretty good. Typically, kids under 12 are 50% off. 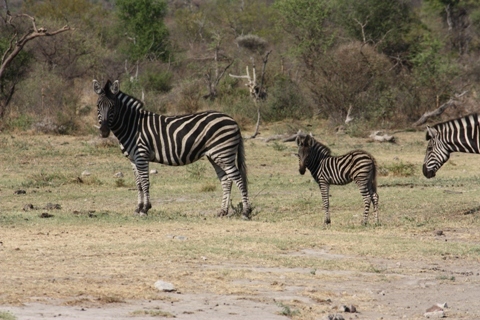 Some lodges (especially in Big Five territory) don’t allow smaller children, so make sure you review their policy. Most lodges offer two game drives per day (early morning and evening), and we’ve found that two or three nights are enough. My advice: Don’t fret too much over picking the “perfect” lodge. You will drive yourself insane. As I said, prices are pretty much the same unless you get lucky and find a great deal, and from our experience and what I’ve heard from friends, the quality is always outstanding. Most lodges will absolutely pamper you with too many delicious meals and loving service. The easiest way to narrow down your choices is by picking a specific game reserve first. Do you want to see the Big Five? Then Madikwe, Welgevonden, and the Kruger Park (or private reserves adjacent to it such as Timbavati, Klaserie, or Sabi Sand) are all good options within fairly easy reach from Johannesburg. Another consideration is malaria – Madikwe and Welgevonden are entirely malaria-free year-round, making them the better choices in my mind, whereas in and around the Kruger you will need to take malaria pills anytime except the winter months (June/July). Yet there is something special about Kruger Park having to do with its history and stunning landscapes that will make you want to go there sooner or later. The Big Five game park closest to Joburg is Pilanesberg, where you can also stay overnight. Now for actually booking your trip: I find Bushbreaks the best website to use. We’ve consistently gotten good rates from them (most of the time better than if you booked through the lodge directly), and their website is very easy to navigate, letting you select lodges based on region or other criteria such as Big Five and malaria-free. You will see all the pertinent information at a glance and they often run specials for certain time periods. Some friends have recommended mtbeds and roomsforafrica especially for last minute deals, but I don’t have any experience with either one of them. I think it should be the Big Six including giraffes! Still overwhelmed? Then just book one of the lodges we’ve been to. Joburg Expat’s picks, if you will. You won’t go wrong with any of them. With all the rain we had that weekend we got stuck in the mud, giving us an additional diversion; in fact, going up and down those steep inclines was pretty scary! This was our first safari, three weeks into living in South Africa. It’s nestled into the mountain in the Waterberg, with stunning views and landscapes. Even though it rained a lot during our stay (with our hosts insisting that it never rains that time of year – such is the pattern when our family travels) we had a wonderful time. Perhaps this was because it was our first safari ever – you will always cherish your first – or because our game ranger, William, was not just an excellent guide but a wonderful person, making us all feel special and loved our entire stay. This was not a Big Five area, but I almost think it was better to start out with “just” rhinos, giraffes, zebras, and wildebeest, because we would have felt overwhelmed with more. And, if you’re an expat and not just a one-time visitor, it’s nice to leave something new for the next time! Mosetlha Bush Camp – very comfy for an Eco Lodge! I’ve also got two more lodges coming up on our calendar. While I haven’t actually seen them yet, one comes highly recommended by a friend, and the other was too good a deal to turn down. Welgevonden has always been a game reserve I’ve wanted to try out. It’s in the Waterberg, which is a beautiful area and also very close to Joburg, malaria-free, it’s a small and exclusive reserve, and it has the Big Five. In short, everything you could want. The only problem is that most lodges there are very expensive and often don’t allow children. However, I needed a place to book for upcoming visitors, and there is a new lodge there that recently opened up and therefore offered good rates. It’s called Jamila Lodge and looks as nice as everything else there; I’ll give you an update once we’ve tried it out. Kitara Camp comes highly recommended by my friend Bing who spent a lovely weekend there some time back. We decided to follow her recommendation and booked it for us and my brother’s family when they come for their annual Christmas visit. Can’t wait to be on a safari again, and maybe get our first glimpse of that elusive leopard! I hope I’ve been able to take that feeling of being completely overwhelmed out of your safari-booking process. Your first safari will be great wherever you go, and every one of them is unique. I’ve heard of people who saw all of the Big Five (in case you are wondering: buffalo, lion, leopard, elephant, rhino) on their very first game drive, but I can honestly say that I’m perfectly happy not belonging to that group. There are so many other animals out there, some of them quite rare, and it’s always nice to keep something in reserve for the next time. For more safari inspiration, also check out these other safari posts. Looking for adventure closer to home? Check out What To Do in Joburg for an extensive list.